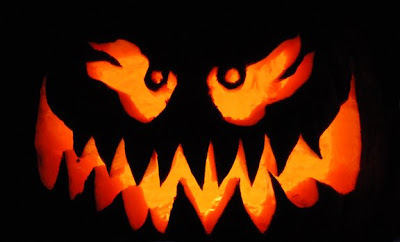 there is nothing like carving a pumpkin into a jack-o'-lantern. grab your favorite saw-toothed knife or other weapon of choice. just start slashing, stabbing, gutting and cutting. savor the catharsis while inflicting pulpy-carnage. scrape out the slimy, gruesome guts (be sure to save the seeds). lacerate and hack away at the giant, fleshy squash. fine-tune to your heart's content. prepare the seeds (do not wash). add salt and spice and bake at 375F. put a candle in your masterpiece. bask in the mellow-orange glow.